The leaders warned that they would continue their struggle till they "change the Central government"
Some hits, some misses in Modi's first term: Does he deserve a second one? 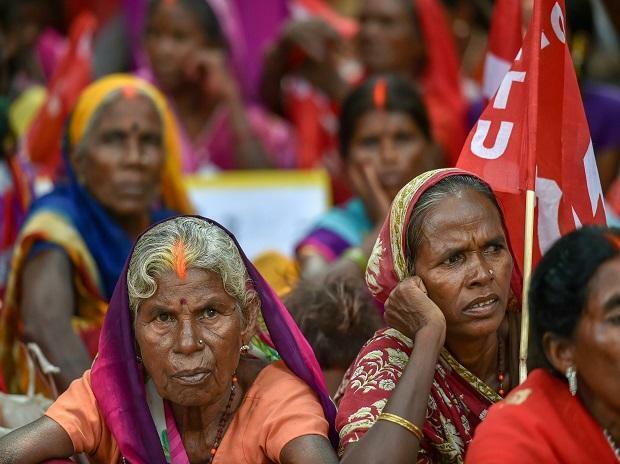 Thousands of farmers and workers affiliated to Left-wing outfits took out a protest march in the national capital Wednesday, demanding implementation of remunerative prices for farm produce, loan waiver, labour laws and a minimum wage of Rs 18,000 a month. The 'Mazdoor Kishan Sangharsh Rally' - being organised jointly by the Centre of Indian Trade Unions (CITU), All India Kisan Sabha (AIKS) and All-India Agricultural Workers' Union (AIAWU) -- began from the Ramlila Maidan amidst rains and passed through various roads to culminate at the Parliament Street. Carrying red flags, the marchers raised slogans against the policies of the BJP government and also assailed the ruling party's "communal and divisive" agenda. AIKS general secretary Hannan Mollah, alleged the government has "never done anything" for farmers since it came to power. "For the last four years, this BJP government has fooled us. It has never done anything for the farmers. We have always demanded that the government should give farmers a remunerative price as per the recommendations of the Swaminathan Committee. We have asked for the minimum wage for the workers which should be not less than Rs 18,000 per month," he said. He alleged that government has ignored their demands. "Now it is high time. We will continue our struggle till our demands are met," Mollah told the gathering. The leaders warned that they would continue their struggle till they "change the Central government". "Workers and farmers coming together has enthused the other sections of the society. Now the Youth Federation has decided to organise a rally on November 3 protesting against unemployment in the country. Before that, they will hold a 24-hour dharna in front of all central government offices in all districts," said Tapan Sen, the general secretary of Centre of Indian Trade Unions (CITU). He said that after the dharna, all other farmers organisations will come together, hold a long march and come to Delhi on November 30. "Trade unions will also hold a two-day strike by the end of the year," he said. "So, we will continue our struggle throughout the year. In this process of struggle, people will gradually understand their no. 1 enemy and accordingly they will decided what to do in the coming elections," Sen said. The rally was also supported by artists, academicians and left-wing intellectuals who came in support of farmers and workers and demanded the Centre accept their demands. Meanwhile, traffic was affected in the Lutyens' Delhi due to the rally. The Delhi Traffic Police tweeted updates on the march. The Parliament Street, Janpath and KG Marg were closed for traffic movement which led to congestion on the alternate routes, the police said.